As I sit here typing on the last day of 2017 I notice our dried out Christmas tree in front of me, hastily purchased from Home Depot a month ago, the ornaments still bravely clinging on. Normally we secure permits from the forest service and cut down our own tree and make it a thing, but this year, spare time is precious and Home Depot trees will have to do. After a two year frustrating search for the right commercial space to open our coffee business here in Truckee, Nick and I quit our jobs in August and signed a joint lease on a space: half office, half warehouse — and a few months later, GEOGRAPHY CREATIVE and DRINK COFFEE DO STUFF were born. I've never had twins, but I imagine this is what it feels like. We're learning more every day: how to operate the businesses of course, but also continually learning how to support one another better — and most of all, growing more in our relationships with Jesus as we rely on Him in entirely new ways. The businesses are both doing well... we've been so grateful for tremendous community support. It's been a really, really good year, but also a painful one. We grieved loss and divorce. We underwent countless unseen business frustrations and, at one point, contemplated moving away from Tahoe. We went to marriage counseling, which ended up being successful for us — I mention this as I think it's important to be open about struggle. Marriage isn't something you sit back and let happen; you continually work on it and pour energy into it. As Nick and I head into our 5th anniversary this upcoming year, we are committed to continually learning how to love one another better and make God the center of our lives. We also traveled a lot of course; this year, I explored more of the US than international travel and couldn't have been happier. This time of year seems to revolve around lists: most liked Instagram photos, resolutions for a fresh start, favorite memory from the past 365 days. I decided to write out a few favorite travel memories from the year. Enjoy! In the spring, I traveled to the San Juan Islands with the Filson team and a group of rad ladies from all over the US for what may be one of the coolest press trips I've ever been invited on (see my recap post here). We foraged our own greens for dinner, which were naturally cooked over an open campfire, and learned how to shuck (and then immediately slurp) delicious oysters at Westcott Bay Shellfish Co. I found myself in the Pacific Northwest almost a dozen times this year, each trip memorable in its own way (check out my guide to Seattle here). As a Sony Alpha photographer, I was fortunate enough to be invited to the first-ever Sony Kando trip in Santa Barbara — a retreat to top all other retreats — alongside some of the most talented and proficient creative humans in the world. Highlights included getting a test run of the new A9, meeting a bonafide wolf, and hearing Cheryl Strayed (author of Wild) speak. I enjoyed spending time with friends and meeting inspiring new ones — can't wait for Kando 2.0! Social media has completely changed the way people travel. Seeing a single photo of a beautiful place can inspire an entire trip. The world feels smaller... and larger all at the same time. When Nick and I spent a week in Munich, Salzburg and Prague in February to celebrate our 30th birthdays, I knew I had to visit Hallstatt — the location of the oldest salt mine on earth. 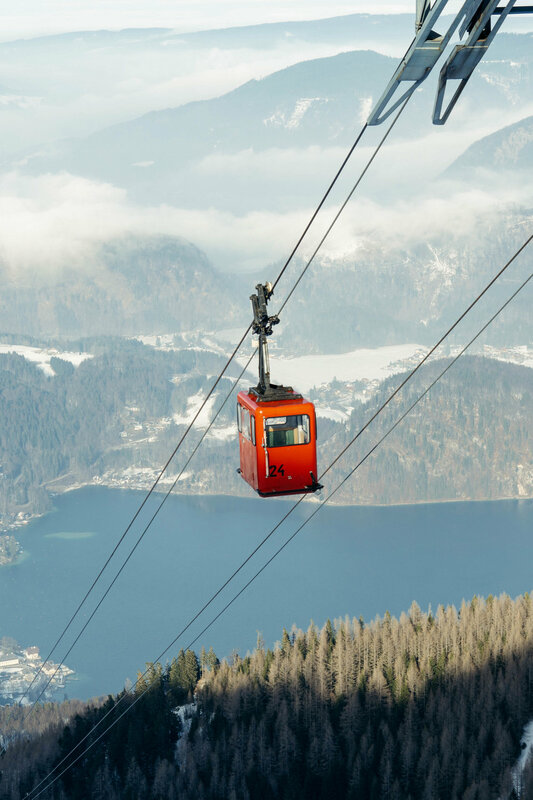 On our drive from Hallstatt back to Salzburg we spotted a gondola hanging above the road, and spontaneously decided to pay a fee and take a ride. From that gondola, Nick shot this photo which later made it onto a DRINK COFFEE DO STUFF tee (for sale here)! If you're traveling to Austria in 2018, add Hallstatt to your list. The stunning drive there is almost more jaw-dropping than the town itself. The recap from our trip can be found here. While in Prague, everyone kept talking about a church made of bones, so we decided to see it for ourselves. Being an hour or so outside of the city, most normal people would book a tour, but we decided to take a train... and got hopelessly lost. Getting off at the wrong stop, we found ourselves in a small village where not a single soul spoke English. Eventually we were able to hail a cab who drove us to the right spot, where we explored an old ossuary decorated with hundreds of human skeletons; even more were being unearthed in an archeological dig right outside. Such a surreal, once-in-a-lifetime experience! This almost didn't make my list, as Disneyland isn't exactly out of place in my travels... Nick and I try to go at least once or twice a year. This particular trip, however, was unique as we were in Orange County to see my family for my grandma's 95th birthday, and were gifted tickets from Alaska Airlines. The spontaneous trip that followed was one my favorite Disneyland trips I've ever had: no stress, lots of laughs, and just enjoying one another's company. May is a great time to go as the summer crowds aren't there yet, and the weather is perfect. I especially loved the newly added Beauty and the Beast details around the park (my favorite Disney movie!). If my eyes were good enough, I'd get my pilot's license in a second. I had the privilege this year of taking a TON of charter flights: two seaplanes in Seattle, a helicopter ride in Hawaii, and countless "work" flights on a Cirrus belonging to my former boss. There's something pretty magical about flying where you want to go, when you want to go, not worrying about traffic or parking. Aviation has definitely changed the way I view travel! In June, I enjoyed a trip with a bunch of my travel blogger friends to St. George, Utah where we explored Zion National Park (and summited Observation Point, a gorgeous hike). Lesser known state parks dotted around Zion were the main focus of the trip, however, and were equally as stunning. If you're heading to Zion in 2018, make sure to check out Red Cliffs Desert Reserve (and super photogenic Babylon Arch Trail), Snow Canyon State Park and Yant Flat Cliffs. Utah continues to impress me! 8. Rock Climbing for the first time in... Vegas?! Last month I spent a couple days exploring the deserts and state parks surrounding Vegas. Between ATVing, hiking, tasting moonshine and rock climbing for the first time at Red Rock Canyon, my viewpoint on Vegas is forever altered. Planning a trip soon? Check out what I did here. Nick's dad recently retired on the Big Island, and so of course we had to go visit him for Christmas this year. I have always wanted to spend Christmas in a tropical destination, and Hawaii did not disappoint! My father-in-law Joe surprised us with a helicopter ride above the volcanos and waterfalls littering the island on Christmas Day which may have been the moment my life peaked. Not sure it gets much better than seeing lava flow on Christmas...! Ever have a moment while traveling that just sticks with you? There have been a few of these moments over the course of my life that have made me fall in love with travel again and again — seeing my first Monet painting in person in Spain, looking at the souks in Marrakech, Morocco while smoking hookah with Nick on our honeymoon, kayaking with icebergs in Alaska — and White Sands National Monument definitely makes this list. We enjoyed at sunset to escape the heat and were treated to an epic lightening storm: one of the those memories photos will never do justice. Wherever 2018 takes you, I hope it involves making memories, living spontaneously and saying yes more than saying no. I'll see you out there. Happy New Year!